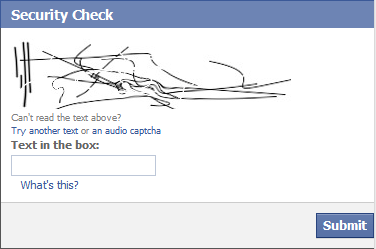 As I am sure most dotTechies know, a ‘CAPTCHA’ is a method used to verify that person logging in, posting, etc. is really a person and not a robot. There are various different types of CAPTCHAs but the most common is being given a picture and told to type the words shown in the picture. Seriously Facebook (and/or third-party app on Facebook)? What the bloody hell is that supposed to be?